Here we are again, a new life and a new adventure. What’s odd though, is that I’m starting in exactly the same place my first adventure started – The coastline by Three Valleys, what are the chances! As with all new lives in DayZ, first things first are getting fed and hydrated, and finding myself a melee weapon to fight off those Zeds. I know of a well nearby, so quickly make my way inland there to get hydrated. On my way I find myself an ice axe, nice! Now I can defend myself. Once I’ve refreshed myself at the well I head North towards Solnichniy in hopes of getting a back pack and a few supplies. The coast is a pretty popular place usually, one because many new lives start here, two because bandits like to prey on those ‘bambi’s’ and three because the odd ‘hero’ will try to help said ‘bambi’s’. It is therefore imperative that I keep my wit’s about me, and don’t get caught out by a highway man. It doesn’t take long to reach my destination, and I make quick work of searching the buildings and dispatching any roaming zombies. Most of the buildings are pretty empty, but I make quick stop at what looks like a big generator on wheels, it was a good choice as I find myself a back pack and a sporter with a 30 round mag attached to it. Clearly someone had been through here recently as the back pack was half full, and you don’t normally find a weapon with a magazine of that size attached to it. Now wanting to stick around to see who left these items, I quickly made my way West in to the woods towards Orlovets. 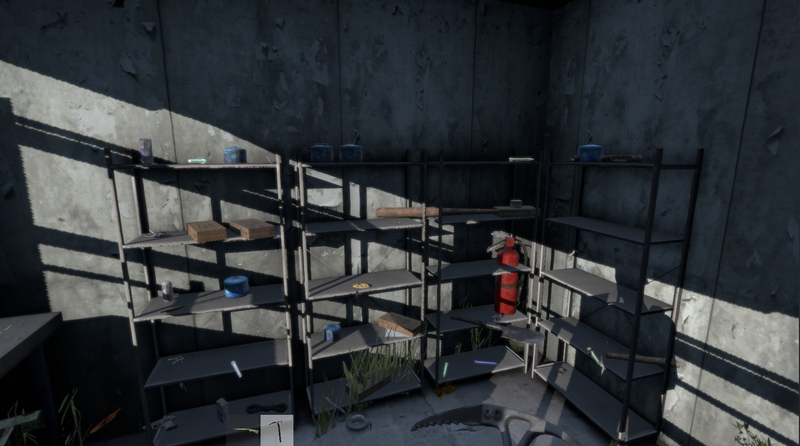 I figured as it was a little way in land and up on top of a hill, so people might not really go there much, and therefore a better chance for loot. It wasn’t wrong. I left Orlovets fully stocked up on supplies and headed further North. Berezino was my destination. Just as I reached Nizhnoye, I received word that some friends were in Solnichniy. I hung around until they caught up. 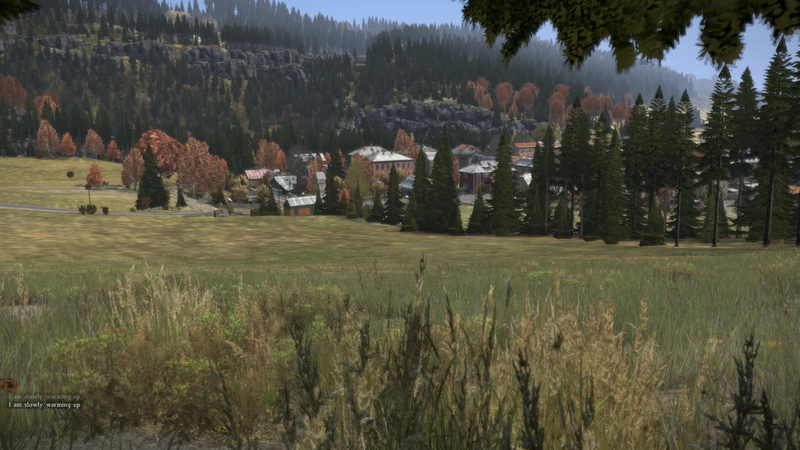 We then moved on to the South East side of Berezino. 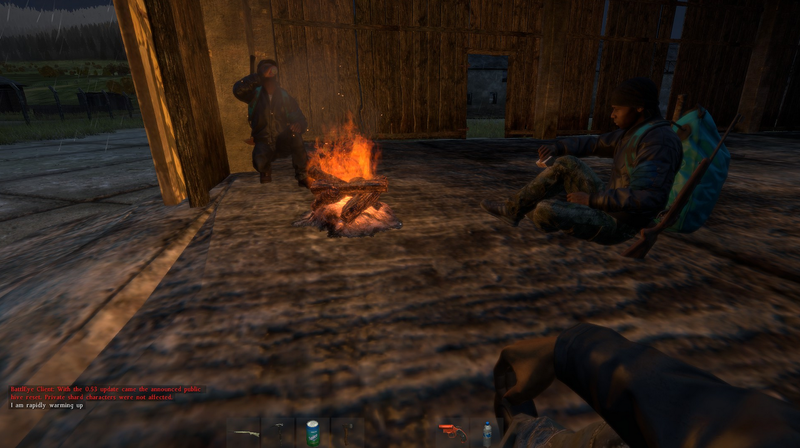 I helped them loot up, and get fed and watered by the fire. Since starting it had done nothing but rain and thunder and lightning, so staying warm and dry was essential. Warming up by the fire, getting out of the storm. Everything seemed quiet on the coast, unusually quiet. We swept through Berezino quickly – no one was around. We decided to continue our journey north. Following the railway line past Rify, and along the coast we spotted our first signs of other life. A few hundred metres in front of us there was someone running along the beach heading North. We decided to pursue them whilst keeping our distance. They continued North following the coast line towards Svetlojarsk(Svet), he didn’t seem aware of us and we were able to slowly close the gap on him. Once he reached Svet, he quickly made his way around the docks and up in to the forest – did he spot us following? We weren’t sure, but we continued on to see what he was up to. Unfortunately we lost him in the woods, and decided to give up the search. Who knows where he’d gone – he seemed to just vanish, one minute he was there, the next…Nothing. After another refresh of food and drink, I was back on my own and making my way in to Svet via the railway lines. I ducked in and out of the rocks keeping an eye out and saw a quick flash of someone walking up the road towards the main square. Again I decided to pursue. He’d just gone out of sight over the top of the hill as I made my way up it, “damn why do you walk so slowly up these hills.” I was thinking. Just as I reached the top a shotgun round boomed in the distance. I ducked in to a bush, BOOM another shot, my heart started to race. They definitely weren’t aimed at me, but that’s not what scared me, what had me spooked was what they were aimed at. Sure, it could just be at zombies, but it seemed a bit reckless to be offloading like that in the middle of a city. Eager to find out what was going on I edged up the hill. I cleared out the nearby buildings, nothing, no traces of anyone either. I crossed the street BOOM, more shots. I continued to sweep through the buildings and continued to hear shotgun shots ringing in the streets – but I didn’t ever find the source or the target of the shots. It was like I was hunting for a ghost who just playing with me, but I continued to search. I made my way towards the main square, a few shots were still blasting in the distance. Just as I walked on to the square SKS round joined in the chorus, still not aimed at me, but they were close. Then, as I ventured further out in to the square, I could’ve sworn a shot whizzed past me and hit the wall behind me, I quickly ran to the nearest building for cover not sure where it had come from or if I’d imagined it. I went upstairs to get a view out of the windows, nothing. I was just about to give up the search again, when I heard what sounded like silenced shots, and lots of them. This was getting really weird now. It felt like these silenced shots were following me around, but there wasn’t anywhere they could be coming from without me seeing. Just a bug? Or was I actually being followed? I decided to leave Svet, it was freaking me out. I could still hear the shots as I was leaving. I decided to perch myself in a tree line on a hill to make sure I wasn’t being followed. No one was there. Leaving Svet, making sure I wasn’t followed. I don’t know what had just been happening in Svet, maybe it was DayZ up to its old tricks, or maybe there were people having a fire fight. But if they were I couldn’t find them, and part of me didn’t want to.